Waxes and Oils are lipids, having hydrophobic properties, and are derived from plants and animals. Oil is simply fat with unsaturated fatty acid chains, and is found in liquid form at room temperature. Waxes are very much like fats or oil, except that they are malleable in normal conditions, and have only single long-chain fatty acid, attached to a long-chain alcohol group. In general, lipids are a group of molecules made up of organic compounds such as fats and oils, waxes, phospholipids, steroids, sphingolipids, and prostaglandins, and are very much like the carbohydrates, but the hydrogen-to-oxygen ratio of lipids will be greater than 2:1. Their carbon-hydrogen-oxygen bonds will also remain non-polar covalent. Lipids are not soluble in water, and they accumulate in the body as a source of energy, making the cells, with the help of carbohydrates and proteins. Waxes are non edible, low melting point solids, available in synthetic and natural forms. The natural waxes that are synthesized by animals contain esters of carboxylic acids bonded to long chain alcohols, while those produced by the plants have typical mixtures of substituted hydrocarbons. 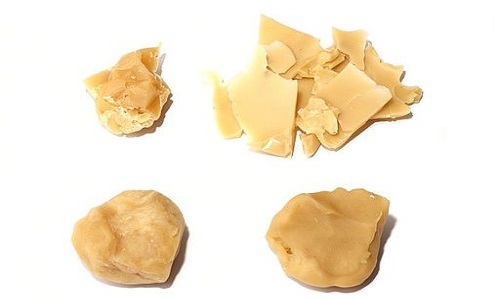 Irrespective of species and geographic locations, the composition of these natural waxes will remain the same. They are very soft and melt easily than the synthetic waxes. Plants make use of the insoluble-in-water nature of their waxes for providing waterproofing and protective covering of stems and leaves by preventing any water leakage. Likewise, animals also produce the waxes to protect their body. The ear wax of humans, which is an example, protects the ears from any foreign materials entering the ear and injuring the canal area. The common beeswax has a composition of ester myricyl palmitate, having a melting point between 62-65 °C. Plant secreted waxes are evolved from mixtures of substituted long-chain aliphatic hydrocarbons, containing alkanes, alkyl esters, and aliphatic hydrocarbons. Looking from the commercial side, the most important plant wax is Carnauba wax, containing ester myricyl cerotate. It is collected from the Brazilian palm called Copernicia prunifera, and is used largely as confectionery and food coatings. Its other applications are polishes for car and furniture, surfboard wax etc. Montan wax collected from coal and lignite has an increased level of saturated fatty acids and alcohols, which makes it hard, dark and smelly. Although most of the natural waxes are from esters, paraffin waxes are made of hydrocarbons and mixtures of alkanes. These materials are obtained from petroleum through vacuum distillation. Paraffin waxes are used in foods, candle making, cosmetics, and waterproofing coatings and polishes. Polyethylene and polypropylene waxes are utilized for colouring plastics. Additionally, it provides matting effects as well as wear-resistant in all kinds of paints. Oil is defined as any neutral, non-polar chemical substance in the form of a viscous liquid at normal temperatures, having hydrophobic and lipophilic properties. It is called a triglyceride as it is formed out of glycerol and three fatty acids through the process of dehydration synthesis. Due to their high carbon and hydrogen content, oils become flammable and slippery. Oil can be extracted from animals, vegetables or petrochemicals either as a volatile or as a non-volatile liquid. It is best as fuel and lubricant, and also as a purifying agent in religious ceremonies. Oil has been used throughout the human history as a support for the life. Cooking oils are produced either from animal fat or from plants, through natural metabolic processes. Organic oils contain chemicals including proteins, waxes and alkaloids. Oil is the most important fuel in the world and is responsible for our present standard of living. Petrol, diesel, jet fuel, etc., are examples of transport oils. The byproducts got during the oil refining process are very valuable and are used in the production of plastics, chemicals, pesticides, fertilizers, lubricants, waxes, tars and asphalts. Commercial oil production was started in the 1850s. Punalur Chandrasekaran. "Difference Between Wax And Oil." DifferenceBetween.net. October 19, 2015 < http://www.differencebetween.net/science/chemistry-science/difference-between-wax-and-oil/ >.